You really can't ignore ANZAC Day living just a few hundred metres down the road from the National War Memorial. We've even been woken early the last few mornings with rehearsals for the dawn ceremony (bagpipes and trumpets carry a long way in the early morning calm). So this morning we joined around 32,000 other Canberrans for the real ANZAC Day dawn service just up the road at the War Memorial. We found a viewing spot by around 5.00am and enjoyed listening to a half hour of readings (from servicemen and women's letters and diaries) to get us all into a reflective mood before the start of the service at 5.30. It is amazing how quiet a crowd of 30,000 people can be. As we'd expected the service was very sombre and solemn, and very predictable (in a good way) - apart from the fact that this year a servicewoman delivered the key address - the first time ever! She delivered a wonderful speech; very warm and heartfelt. The dawn service is conducted in complete darkness apart from spotlights on the key players - very moody! Afterwards we walked a small distance up Mt Ainslie to the site of the Aboriginal and Torres Strait Islander (A & TSI) bush memorial for a commemorative service for A & TSI servicemen. It was so different in character from the formal service at the War Memorial: warm and personal, lots of stories and smiles, smoke and didgeridoos, and this beautiful bush setting! By the time we were walking back home the morning sun was making everything glow. We stopped for coffee and a toastie afterward at our new C5 café (although just a pop up at this stage). We were amused by the magpies who did everything they could to convince us to give them a feed. They would be so easy to tame! Despite how it looks in this pic there were lots of people around walking back from the dawn service - there was a lovely friendly vibe to the morning. Time for a shower and change and then it was back out on Anzac Parade to observe preparations for the march past and commemorative service. We were surprised by how warm it was today - the hottest ANZAC Day on record. All the important action was up at the War Memorial - our Anzac Parade was really just a marshalling area for the groups of veterans and service men and women getting ready for the official march past (the Governor-General took the salute). ANZAC Day ceremonies have always been tightly controlled by the Returned Services League (RSL), and in latter years increasingly more by whichever political party is in power. In the process some veterans have been marginalised and militarism rather than sombre reflection has become more of a focus. So it was interesting to see this year a group commemorating the Frontier Wars in Australia lining up at the rear of the other marchers ...... recognising so many Aboriginal and Torres Strait Islander lives lost in massacres and acts of genocide over the colonial period. This group was not allowed to participate in the official march past however. It is the war we dare not name! 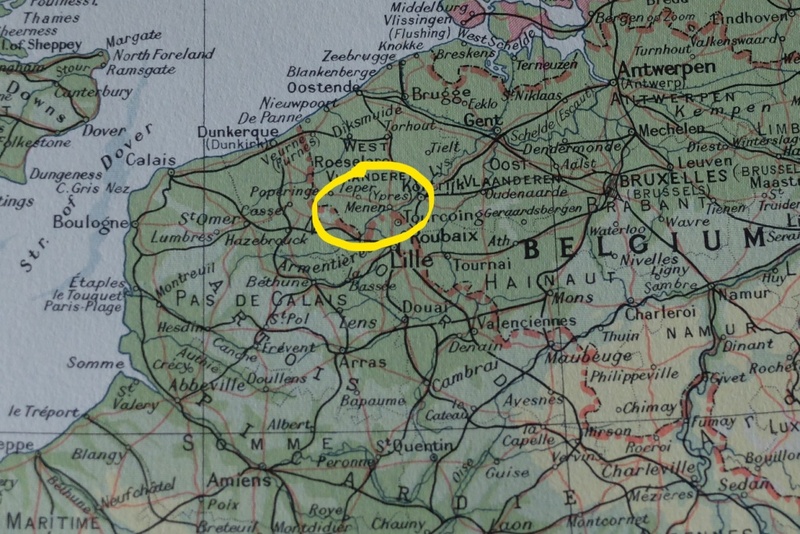 All the talk this Anzac Day has been about the 100th anniversary of the battle at Villers-Brettoneaux (near Amiens in France) and the opening of the $100,000,000 Sir John Monash Centre there. 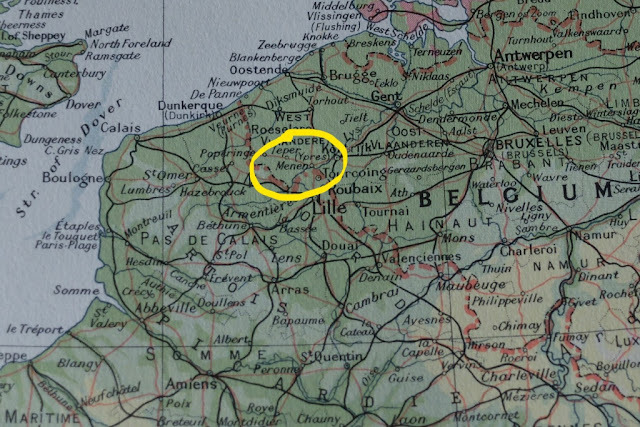 William Dutton was killed about 120klms north of there in Belgium - and about 9 months ahead of that momentous battle. Another casualty in a war that took over 60,000 young Australian lives for a cause that is hard to justify in the cold hard light of day. It gives us all such a lot to think about!! !